Opening a retirement account should be an important rite of passage. Unfortunately, too many people skip it: Around 42% of baby boomers haven’t saved a dime for retirement, according to a study from the Insured Retirement Institute. It’s almost hard to believe. Baby boomers are nearing or at retirement age, and too many of them are completely unprepared. Luckily, Wealthy Retirement readers are well ahead of the average boomer. Our recent survey found that only 2.8% of respondents didn’t have a retirement account. Even better, Wealthy Retirement readers started planning for their retirement early. About 36% started saving by the time they were 25 years old. 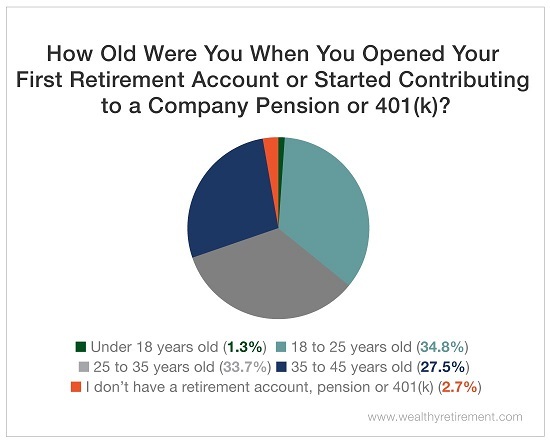 An additional 34% had opened accounts by the time they were 35 years old. Investing early means that you have more time to take advantage of compound interest. As Marc Lichtenfeld has demonstrated many times before, harnessing the power of compounding through dividend reinvestment is an easy way to grow your wealth, and it can more than triple your original investment in just 10 years. But there is a problem: Our readers aren’t saving enough. Experts recommend having six times your annual earnings saved by the time you turn 50 years old. According to the Bureau of Labor Statistics, the median wage for workers is around $47,000. That means that the average worker should have about $282,000 saved for retirement by age 50. Most of our survey respondents haven’t reached that goal. 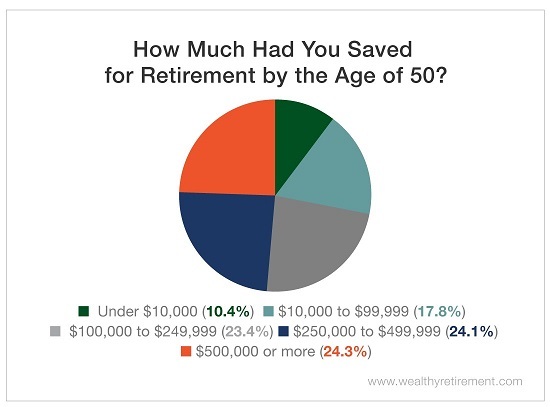 More than 51% said they’d saved less than $250,000 for retirement by age 50. More than 10% said they’d saved under $10,000. Although Wealthy Retirement readers have a big head start on baby boomers when it comes to opening retirement accounts, they still aren’t where they need to be when it comes to saving. Luckily, even at 50 years old, there’s still time to catch up. In 2019, you’ll be able to contribute $19,000 of pretax funds to your 401(k). That’s up from $18,500 in 2018. You’ll also be able to save up to $6,000 in your IRA, as opposed to $5,500 in 2018. If you’re 50 or older, you can put an additional $6,000 into your 401(k) or an additional $1,000 into your IRA. Those extra pretax dollars can go a long way toward making up for a retirement savings deficit. Even if you’re behind on your retirement savings, don’t give up on your goals. It’s still possible to secure a comfortable retirement – you have just have to save a little bit more and invest smarter.